← More Lovecraftian Items Have Been Posted on Flickr! 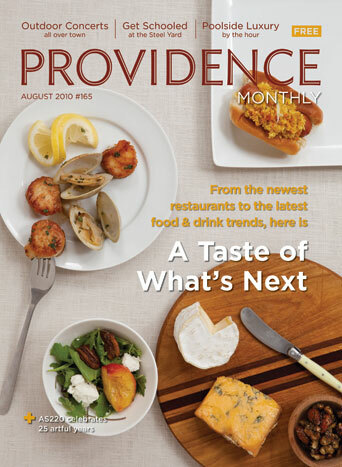 Did you manage to get your hands on a copy of the August issue of Providence Monthly? It contains a piece on H. P. Lovecraft in “The Last Detail” section on the back page; and it includes one of my H.P.L. headstone photos from my Flickr collections at: http://www.flickr.com/photos/cthulhuwho1/collections/ . In early July, I began promoting the idea for an August piece on “120 Years of H.P. Lovecraft and Providence” to a large number of newspapers and magazines, and Providence Monthly is the only one that responded with a desire to run with it. Get your hands on a copy of the issue to see what they actually printed; and your comments are welcome! The Providence Monthly is the free, oversized magazine that profiles the people, places and things that make Providence a great city; and that can be found in bars, restaurants, coffee shops, boutiques, art galleries, or any place around town where people congregate and interesting things happen. Eighteen thousand copies are distributed each month. This entry was posted in H. P. Lovecraft, H. P. Lovecraft Updates, Providence Monthly, William (Will) Hart and tagged H. P. Lovecraft, Providence Monthly, William Hart. Bookmark the permalink.